For a line by line word for word translation of the Scroll text of Isaiah 53 click here. There is a horizontal stroke in the right margin which would mark the end of chapter 52 and the beginning of chapter 53. There is no corresponding mark to show the end of the section so marked. The strokes usually come in pairs but this one does not seem to be paired. The mark above the last word in line 18 is mine and my error. A new paragraph is marked in the usual way to begin chapter 53 on line 5. A new paragraph is marked in an unusual way in lines 15 and 16. Line 15 ends a paragraph by not filling out the line and the usual manner would be to start at the right margin on the next line for a new paragraph. but line 16 has what must be described as a huge indentation to mark the new paragraph. This kind of a gap in the text is only associated in other places with missing text which is known to have been omitted so that when the text was not in the manuscript from which the scribe was copying he would leave a large gap to indicate the missing text. There is no such missing text in this place in the Masoretic text. Thus the reason for the large gap is not readily explainable. The usual way of indenting to show a new paragraph is seen two lines below in line 18, but this is in mid verse 53:10 and can not be thought to be a new paragraph. The new paragraph of lines 23 and 24 mark the end of Isaiah 53 and the beginning of chapter 54. The Spatium in line 12 does not mark a current verse-beginning but is an indication that the scribe thought it did or copied from a text which indicated a thought break here much like the beginning of a new sentence. There is also a spatium at the beginning of 54:2 in line 24 and perhaps also in the next two lines but they are smaller gaps. A resh is added to the 2nd word in line 14 to complete and correct the word. The 5th word in line 16 has been corrected and recorrected and an "s" like symbol written above the correction. There may be a stroke on the left side of this symbol which would be seen by some then as an edited tau but that is a very crudely formed tau if it is so. There are 14 taus in the last 4 lines of this page that you can compare this symbol with, It is difficult to see what the third letter was when first written but the word begins with waw and ayin which are clearly seen and certain and have no corrections on them but the 3rd letter could possibly contain the strokes of nun, mem and tau, having been written once and an attempt made to change it two times.. The mem and the nun are most certain but the tau which ought to be written here is less certain. The word should be sign of accusative spelled aleph-tau but may be misspelled ayin-tau or may be ayin-mem (with) when all is concluded. An editor added a waw to the 8th word in line 27 which makes the text the same as M. The marks over the 1st word in the last line are probably due to marginal discoloration and not editorial. For an example of addition of "he" to 2ms suf to distinguish it from 2fs see the first word in line 2. An example of waw standing for any vowel can be seen in line 23: 6th word: An example of adding yod to 2fs suffix is seen in the last word in line 24. See intro page for other examples of addition of yod to make a sure 2fs suf. Line 2: 4th word: Q = addition of yod to a noun (mishchat) making it plural construct instead of sing. as in M. last word: Q = article "he" not in M.
Line 3: 5th word: Q = "ve- eth" conj + accus. not in M.
Line 5 last word: Not him but us. This is the first line of Isa 53. 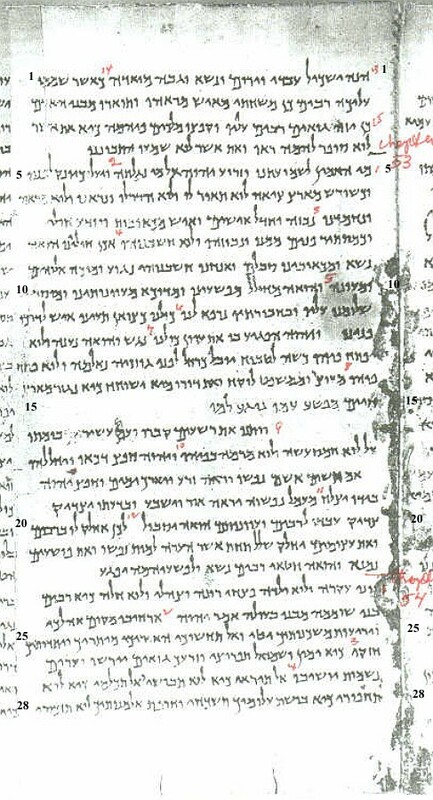 The last word written in the margin is a bit faded and M has lephanayv meaning "before him" or in his presence. But the Q scribe has clearly written lephannu meaning "before us" or in our presence. see the enlargement to note different spelling in Q. Line 6: 3rd word: Q = addition of aleph to middle of word not requiring aleph. 9th word: Q = "lo" (to him) not in M. 10th word: Q = "ve-nir'e:nu" cj + verb 1cpl + suf 1cpl (that we see us) and M = "ve-nir'e:hu" same + suf 3ms (when we see him) Q must be a simple mistake with the wrong suf since the sentence does not make sense with a 1cpl suf. Line 8: 4th word: Q = "ve-nibuzhu" (and we despised him) and M = "nibzeh" (he was despised). Line 9: next to last word: Q = waw cj not in M.
Line 10: last word: Q = cj waw not in M.
Line 10 and 11 (10: 6th and 11: 3rd) Q adds yod to make these words plural and in M sing. Line 17: 6th word: Q = "be-piyhu" (in his mouth) and M = "be-piyv" (in his mouth). Last word: Q = "Ve-yechallehu" cj + verb imp 3ms + suf 3ms ( and he shall grievously afflict him) and M = "hecheliy" 5th stem pf 3ms. (he shall cause grief) no suffix but "to him" is understood. Line 18: 2nd word: Q = a mistake in the first letter is heavily overwritten to leave a tau showing. 7th word: Q adds waw cj not in M.
Line 19: 4th word: Q = addition of "he" to the end of the word "nephsho" (his soul). 6th word: Q = an extra word " 'or" (light). Line 22: last 2 words: Q = "ve-laposh'aeyhemah yiphgia' " cj + prep + noun pl cnst + suf 3mpl and verb 1st stem imp 3ms (and he shall intercede for their transgressions) and M = "ve-laposhiym yaphgiya' " cj + noun ms and 5th stem verb 3ms ( and he shall make intercession for the transgressors) . Line 23: 7th word: Q = waw cj not in M.
Line 24: 7th word: Q = a spelling or "typo" mistake. first letter is aleph, should be "he." This may be the same kind of scribal error made in isaiah 63:3, where an Aramaic speaking scribe unconsciously substituted a 5th stem preformative "alep" for the required Hebrew 5th stem preformative "he." See a discussion of the same probable mistake as is done with this word above in Isaiah 63:3.